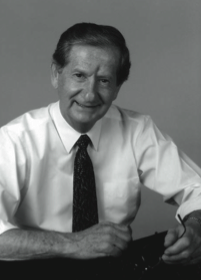 Wayne T. Alderson, along with his daughter Nancy McDonnell, founded Value of the Person seminars in the early 1980s. The principles they have developed came out of Wayne’s experiences as vice president of Pittron Steel in Glassport, Pennsylvania, near Pittsburgh. Through Value of the Person, they have conducted hundreds of seminars and consulted with scores of businesses regarding what they call Theory R Management, a leadership style based on treating people in the workforce with love, dignity, and respect. They authored one book, Theory R Management in 1994. A film was created about the experiences at Pittron Steel titled Miracle of Pittron, and a book that chronicles Wayne’s life and the story of Pittron, Stronger Than Steel was written by R.C. Sproul in 1980. At 18 years of age, Wayne enlisted in the U.S. Army. He was a point man, a combat infantryman. He received the Purple Heart, Bronze Star, Combat Infantry Badge, Silver Star, and several French medals. The Medal of Honor is pending. He graduated from Robert Morris College in Pittsburgh, Pennsylvania, with a business degree. Alderson continues to run seminars, leadership development workshops and mentoring sessions, and to speak and consult with companies about principles of Value of the Person-Theory R.
Ethix: Tell us where the name of your organization, Value of the Person, came from and what it really means to you. Wayne Alderson: I believe the name was planted in my psyche when I was a young kid. My father, my uncles, and my grandfather were all coal miners. My grandfather was killed in the mines. This was a time when the labor movement was strong in the coal mines and steel mills, led by men like John L. Lewis and Philip Murray, heavyweight names in the labor movement. My family was disrupted by the strife of the coal fields. In fact, if seemed as though my father loved the union more than he loved his family. We had a price to pay for the labor wars that were fought. I don’t remember much about my father, but I remember this as if it were yesterday: I was just a young boy, when he came home and said to my mother, “Ede, why don’t they value us as much as they value the mule?” It was my father’s thirst and hunger to be treated with dignity and respect, to be as important as the mule. I vowed at an early age that if I’d ever get into management, I would change that. The opportunity came years and years later after I had gone into war, understood leadership, and understood sacrifice. War exacts a high price, and it is all about survival, about loyalty and commitment to your friends. Flag and country lasted till the first bullet went over your head. Then you were faced with the question of how to survive and protect each other. My experiences in the coal mines and as a point man on the front line helped me years later when I found myself in charge of operations at a steel company in the midst of a violent strike. Once again, it came down to commitment, loyalty, and value. And I knew instinctively it was all about valuing people. After leaving the steel company, I founded Value of the Person-Theory R Consultants to carry on the promotion of these fundamental business principles. Many people call me because of the name of our organization. There is something magic about the words “value of the person.” Everyone intuitively understands it. It came from my background and my passions. How was it that you didn’t end up in the coal mines yourself? At the age of 15, I committed myself to getting out of the environment I was in. With my mother and six siblings, we lived in a tent in utter poverty. Back then, when your father worked in the mines, you had to rent a company house and shop at the company store. Your paycheck would at best be net zero or negative after they took the expenses out of your pay. So you were a victim, a hostage, and I decided I wanted to run away. Uncle Sam was calling me. When Pearl Harbor started World War II, I was 15 and tried to enlist. I almost got in, but was turned away because the recruiter knew my mother. But at 18, my mother couldn’t stop me. I joined the Army and volunteered for the infantry. That may have been the most horrible time in my life, but also the time where I learned the most valuable lessons. My four best buddies got killed, and I was severely wounded with shrapnel from a hand grenade that left me with a “hole in my head.” In fact, I kid in my seminars, “My name is Wayne, the man with the hole in my head!” I had to deal with eight years going in and out of hospitals. But each experience shaped my character and made me who I am today. And did you go to school? I did go to school, but I went to a business school rather than the University of Pittsburgh where I wanted to go. Because of my injuries, the doctors didn’t think I would live past 21. The people in the VA hospital who were there to guide and direct me, said because of my condition, they would not permit me to go to the university. It was not what I wanted, but I was able to escape the life I grew up with. I was the only one in my family who moved into management. I married my wife, Nancy, while still in school, and things started to change for me. It was my father’s thirst and hunger to be treated with dignity and respect, to be as important as the mule. After school I joined Continental Can, a good company. But when I didn’t want to relocate to New York, I took a position with Pittron Steel. For 10 years, I had an ordinary career as a financial officer until the plant was faced with a horrible and violent strike. It was then that I received the call to vice president of operations. There were a lot of good things about Pittron, but even with those it was still a hellhole because of the hatred that union and management had for each other. And then there was the union president, Sam Piccolo, a man who truly hated management as well. The strike he led was ugly, long, and threatened to take the company under. Even then, however, I was drawn to the plight of the workers, thinking about the men without paychecks and a Christmas without presents for the kids. You need to read people, particularly your enemy, and here is where the war helped me. When you are in the infantry, you are “this close” to both your enemy and to death. You cannot afford to make mistakes. You have to depend on your friends, you have to be tough, you have to survive. I was soon to learn that what happened on the battlefields in Germany would prepare me for the battle between labor and management in the workplace. Those skills were vital and helped me to settle the strike after 84 days. Though I was not on the negotiating team, I entered into a discussion with Piccolo and his men to break the logjam, and the strike was finally settled. There was, however, a big difference between war and the battle with union and management. The battle in the workplace was fought by men and women who desperately wanted to be treated with value. This was key to settling the strike, and became a key to everything I have done since. I am not an arbitrator, a mediator, or a negotiator. I am a peacemaker. What kind of changes did you make after the strike? I tried to put in place anything that would demonstrate to people that they were valued. It included things like painting the factory and cleaning the windows so that light could come in. It had been a horrible place to work before, and we wanted to make it attractive. Sam Piccolo, the union president always did his work from the cab of a crane, but we wanted to demonstrate his value, and the value of the position. So we gave him an office. I would go down to the gate at shift change to shake hands with the employees and thank them for a good day’s work. I learned their names and called them by name. It is a difficult thing to stand at the gate at the end of a shift. You are naked there, but I was motivated to do it because I believed it was right. Some people didn’t know what to make of this and would walk by with their heads down. But over time they came to see that the efforts were sincere, that change was real, and they began to raise their heads and talk. I empowered my managers and walked them through this new way of leading. Together we started Operation Turnaround and set the course for a new way to manage. I was not pro-management or pro- union. I was pro-people. The principles are rooted in treating individuals with love, dignity, and respect. In the early days, because we had people working three shifts, I would stay at the office around the clock to interact with the entire work force. One time my daughter, Nancy, came to the plant to see me, and I almost ran her down because I was eager to get to the gate before shift change! My family put up with a lot during that transition time. We also committed to improving communications. People needed to know how we were doing, and this meant being very open and honest about everything. Sam Piccolo embraced the vision and joined with me to fight for the “new” style of management. Value of the Person was win- win for everyone. I gave special attention to frontline supervisors, one of the most ripped off groups in management. While the union kicks them in the backside, management is quick to blame them for all the mistakes, while taking credit when things go well. So these frontline supervisors needed to experience love, dignity, and respect. As they experienced a change, they began to change themselves and lead the charge for the Value of the Person. These are just a few examples of changes that led to our success. The results were unbelievable: a united work force and an outstanding bottom line. To this day, I have a hard time understanding the scope of what happened. But I know this, the change was real because we reached the people. As I conduct seminars and consult with companies today, I find that those who embrace these same principles and implement the leadership of the Value of the Person experience the same dramatic results as we did at Pittron. Why is a person’s name so important? Because when you use a person’s name, you value them intrinsically. When we conduct our seminars, let’s say 100 people attend. I would make sure that by the end of the second day I would know all 100 first names. I didn’t have a formula. I just made it a priority. It identifies you as someone who cares, and that is very important. It’s the little things. Did everyone from the union to your management staff to your boss buy into these changes? Not at all! The union was extremely suspicious at first. Ultimately, I became fast friends with Piccolo and Lefty Scumaci, another tough union leader. They became committed to the Value of the Person because they experienced it firsthand. They saw that it brought dignity to the men and women they represented. It was not another management program. It went beyond program to becoming a way of life. Later, they even helped me teach Value of the Person at our seminars. My staff fought it also. At first they did not want reconciliation. After an 84-day strike, they wanted to get back at the union and continue the warfare. They thought I was crazy but eventually came on board. At the time, Pittron was a division of Textron in Providence, Rhode Island, and our CEO was G. William Miller, who later became the secretary of treasury under President Jimmy Carter. He was a good man, and very tough. If you cut his main artery, ice water would run out! All he cared about was the bottom line. During the strike, I was called to Providence to meet with Miller. He wanted new management to provide leadership after the strike. He wanted a new face at the top. When he asked to see my business plan, I laid out a five-year plan with an outstanding bottom line. He was happy about the business plan, but questioned whether we could make it happen because of the strike. It was hard to believe, but I knew inside of me that we could do it. There was no book on what to do, there was no mentor, but there were the people. And I knew that the key to success is in reaching the hearts of your people. I did go off to Harvard back in the early ’70s to discuss some of these early ideas of working with people. The professor I met with said, “I want to tell you something: We at Harvard know the difference. People are unnecessary overhead cost. You’re on the wrong track with this people approach and are destined to failure.” Finally when he saw I would not give in, he offered some advice. If you are going to develop this new leadership training, make it so complicated no one knows what you are talking about. Management usually buys into things they don’t understand! Years later we met again and talked about the Value of the Person. He complimented me by saying, “I’m really proud of you.” I never quit, but I didn’t have anyone to tell me I was doing the right thing. This is where I started developing and formalizing the principles we teach today in our Value of the Person seminars. The principles are rooted in treating individuals with love, dignity, and respect. We call them Theory R, a management theory based on doing the right thing. As I studied Theory X management, management by authority, and Theory Y, participative management, I saw that neither of these theories captured properly the idea of fundamentally respecting each person in the workplace. With my daughter, Nancy McDonnell, we put together the 5 Fundamentals of Theory R Management that we teach in our seminars. The fundamental guideline is to do what is right. The fundamental principle is to build relationships. The fundamental goal is to choose reconciliation. The fundamental response is to take responsibility. The fundamental by-product is outstanding results. I am a tough business man, so as I reflect back on my dialogue with G. William Miller, I was not proposing a business plan that was out of reach, based on a weak sentimental approach. I am also a capitalist with a capital C. I believe in profit, productivity, quality — all of what it takes to make a successful company. But where I differ with traditional management is the way to get it. Are you suggesting that you treat people well in order to achieve higher profit and productivity? Absolutely not! Value of the Person-Theory R is not about manipulation! You do it because it is the right thing to do. Unconditionally. If you don’t genuinely value people, and simply try to gain a bottom-line result, they will see through you in an instant. It will backfire. No, it is about truly valuing people. Some may think that you will give up business results by treating people well. The opposite is true. In fact, business thrives with a valued work force. This distinction can be worked out in many different ways, every day within the workplace. I remember dealing with one of the guys in maintenance who would go home drunk each night. He would embarrass himself and his family. His kids were horrified and ashamed. The standard procedure in a case like this is to build a case against him so you can fire him. I wanted to salvage him — both his career and his life. I remember saying to him, “You are going to be fired, but why don’t you tell me what your problem is?” He said, “I can’t stop drinking.” So I told him that we would give him a chance, send him to a rehab center in Philadelphia for a month, and I would take care of his family and the bills. During those years, this was unheard of. Piccolo couldn’t believe it at first, but it soon became a turning point for building trust between us. Later, we wrote this kind of support into the labor contract, which was cutting edge at that time. When he returned to his job, he became one of the best workers. He never missed a day and never touched booze again. I still see some of these people, and their children and grandchildren, years later. You see, you can’t run a business without committed employees. Management under pressure can resort to short-term thinking, and valuing people is a long-term strategy. I became their friend, but I never lost my title. I never became buddy-buddy. I was a tough, disciplined yet fair leader. And through this we became a family. Absenteeism was eliminated. We went from 1,200 grievances to none. We experienced perfect quality and double-digit productivity improvement. I could trace all of this back to when we became a family. At the workers’ request, we even started a Bible study on our own time. I didn’t want to do it, and was later told by Piccolo they were testing me when they came up with the idea. But we started meeting regularly to look at how we could value people, talking together across labor and management lines. Piccolo and I were involved together, showing the elimination of barriers between labor and management. And you were voted Man of the Year for Labor in the state of Pennsylvania? Yes. It was the first, and remains the only time, that a person from management was selected as the Man of the Year for Labor. Did everyone get on board at Pittron? No. This will never happen. But I would say 90 percent of the people were on board, and that can make a huge difference. If you want to do what’s right you need to be in the right relationships. When this happens in the work place it spreads to the home. Workers and managers will relate better to their spouse and their kids. It is better for them, and also better for the business. We have a tendency in business to get things backward. We put in rules to protect ourselves from 10 percent of the people who might take advantage of us, and alienate 90 percent of the people in the process. We need to change the thinking. Manage the 10 percent, and lead the 90 percent who want to do what is right. This type of leadership will create the environment where people choose to do quality work and be loyal to the company. When you touch the hearts of the people, you will win your work force and build your company. I was called in to meet with the new owners. After much discussion I finally said, “Maybe your problem is that you need to make the rest of your company like Pittron instead of trying to make us like all of you.” He reconfirmed his thinking, “We want the results, but you have to do it our way. If you don’t, I will let you go.” I was this close to saying yes, but I couldn’t. I said, “No.” He was asking me not just to compromise, but capitulate everything I stood for. I honestly believe he was sad. But as I look back on this, I realize I deserved to be fired because I disobeyed an order of the CEO. You don’t disobey orders from a CEO and survive. I rebounded with another thought, “Hey, getting rid of me isn’t that bad but I want to tell you about the good management people you have here. They have been trained in Theory R and are more knowledgeable and skilled in steel making than me.” After giving him the four names I came to find out later that he fired all four. Wayne Alderson and his daughter and partner Nancy McDonnell. It took seven years for Pittron to close, but the Value of the Person did not close with it. It lives on to this day. Nearly 40 years later I am still passionate for the Value of the Person. I said at the time, it would take 50 years to build a movement, and I committed myself to that cause. I have built a movement of people throughout the world who have been influenced by the Value of the Person and have carried that spirit into their workplace and into their homes. I love what I do. I had many opportunities to run other operations, to receive great financial packages, but I felt my calling was to take the message, what we had learned at Pittron, and create a forum to teach others this new way of managing. Value of the Person calls for reformation. For managers to become great leaders. You were under consideration for secretary of labor a few years after leaving Pittron. What ever happened with that? I had a different idea of what a secretary of labor should do than what the administration did. My belief was that they should be with their people, inspiring them to be the best. I wanted to challenge the American labor movement to declare economic war on Japan and the other countries competing with us economically. We needed to land on their shores with television sets, automobiles, and other well-made American goods created by productive, motivated work forces. The administration wanted a bureaucrat sitting in Washington, D.C. There was no match between their vision of the job and mine. The examples from Pittron happened many years ago. This is a different era: globalization, technology, financial crises. And the work force is very different today, with more service, less manufacturing, and a generally more educated work force today. So what does Value of the Person mean today? It’s the right message for anytime, for any economy or any industry. In fact, it may be more important now than it was 30 years ago. It is fundamental human nature that people want to be respected. Regardless of the level of education or the type of work, people want to be respected and led by men and women of vision who care about them and their families. I have worked with large and small corporations, health care, restaurants, manufacturing, aerospace and so many more. In every case, I have experienced success. Better bottom lines and, even more important, I have seen people’s lives improved both at work and in their homes. Today I’m working at all levels with an international corporation based in Chicago, from the CEO and his executive staff to their various divisions on the factory floor. The foundation for the Value of the Person is getting stronger and stronger. They are experiencing a cultural transformation, treating the people well and affecting the bottom line as a byproduct. It takes courage to lead in this way, because it requires a long-term view, and this is becoming an increasingly short-term world. Their leadership team has captured the vision and embraced the change to make a good company great. A few years ago, I recommended you for a project at a large company in the West. The company had a major union contract coming up, and wanted to avoid a labor strike. They asked you to come out and interview, but you decided not to. Why was that? It was a lucrative potential contract, but I decided I didn’t want to take their money and fail. The management team wanted me to come out and interview, along with several other candidates. After they selected the person, they were then going to introduce that person to the union. Right away, the union is against me and, if it’s the reverse, then management would be against me too. It must be a joint process. I told them the strategy was doomed to failure. What they needed to do was bring the candidates out to be jointly interviewed by management and the union. Then the two could select the right person together. They did not want to take that approach, and I decided I couldn’t take their money under their plan. I don’t know who they selected, but I did watch with sadness as the company, and the workers, were crippled by a long strike. If you look at labor disputes over the years, there is plenty of opportunity to point the finger at labor, and plenty of opportunity to point the finger at management. I do believe that since management is in the primary position of power, they must take the lead in setting the right tone for discussion. That’s where this particular project failed. It is my observation that making Value of the Person work requires leadership and commitment. When you let up, there seems to be a natural deterioration with people going back to their old ways. Do you agree with this, and if so, why do you think it is the case? On the one hand, when someone has worked in an organization that values people, they don’t want to work in a more traditional business. It is too important to their success and feeling of accomplishment. But on the other hand, management under pressure can resort to short-term thinking, and valuing people is a long-term strategy. It is difficult for many business leaders to maintain that focus on the longer term. Perhaps this is the reason. In today’s economy, you cannot afford to just be good. You’ve got to be about change, good to better to best. What is it that can get us better? It’s valuing people. Transforming the principles into the fabric of the organization. Making it part of the criteria for advancement, part of the training, a key quality in choosing new hires. It takes vision, commitment, and out-of-the-box thinking. It requires guts to make it happen. You don’t have an option of not showing up for work. You’d better be at work. You don’t have an option to produce poor quality. You’d better put out a quality product. So, why is valuing people as a management style an option for so many companies? How do you know you have been effective at implementing those principles in an organization? What are the indicators of effectiveness to say that this organization is improving? Much of the answer to this comes from employee surveys, from intangibles, from simply walking around and observing the interactions between people. Of course, I believe you see this as well in the bottom- line profitability. But proving the link between Value of the Person implementation and profit is harder. And if this is the only reason for doing it, then it can become manipulative. It requires leaders committed to Value of the Person, not as a means to some other end but as an end in itself. Profits, productivity, quality, and a successful thriving company will come as a by-product, I believe. Stronger Than Steel by R.C. Sproul (1980), is the biography of Wayne Alderson through the years at Pittron Steel. Theory R. Management: How to Utilize the Value of the Person Leadership Principles of Love, Dignity, and Respect by Wayne T. Alderson and Nancy Alderson McDonnell (1994) summarizes their leadership principles. Both are available from online booksellers as well as through the Value of the Person website: www.valueoftheperson.com. The documentary film, “Miracle of Pittron,” is in the process of being offered for sale. Wayne is a quality guy in which his values and leadership examples have stood the test of time. Wayne was instrumental in organizing the group of union, management, clergy and civic leaders in the Ohio Valley Area during the 1996-1997 Steelworkers Strike at Wheeling Pittsburgh Steel. Under Wayne’s guidance, the group came together to meet, talk and to pray for the ending of the labor dispute during that critical time in the Ohio Valley’s steelmaking history. We need more men like Wayne to get our steelmaking jobs back and bring productivity back to America. We went through a case study of Wayne Alderson in our Masters in Leadership class today. I was intrigued by the story of the great turnaround and had to look it up. i am impressed with the interview and only missed the aspect of where his beliefs stem from. Thanks to Mr. Alderson for being bold and uncompromising! Surely he was a great leader and may God help us to walk like he did and value people.